The Washington Redskins amassed a good deal of talent in the 2018 NFL Draft. Let’s review the 2018 draft class and grade each one. 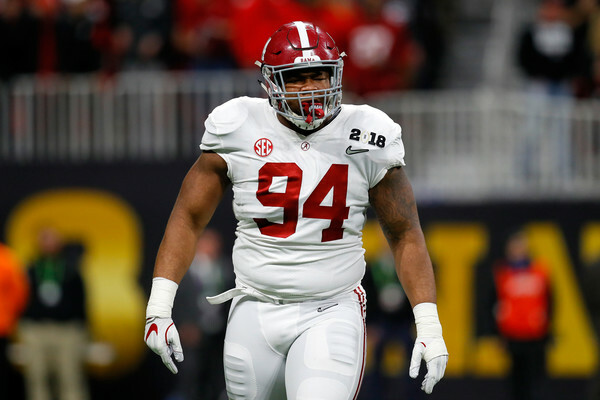 With the 13th pick of the NFL Draft the Redskins selected Alabama defensive tackle Da’Ron Payne. At the combine Payne measured in at 6’3 and 311 pounds and showed impressive speed running the 40-yard dash in 4.95 seconds. Last season on the National Champion Crimson Tide, Payne had 53 total tackles with one sack. Payne’s main responsibility was to stop the run and plug up the middle of the defense. The Redskins had the last ranked rushing defense last season. Breaking that stat down further when Jonathan Allen played weeks one through six, the Redskins gave up one 100 yard rushing total. After his injury the Redskins only held one team under 100 yards rushing. Partnering Payne with his former teammate Jonathan Allen would be a fierce tandem. Payne has the ability to not just be a nose tackle but can play on passing downs as well. Some of the negatives on Payne is sometimes he look disinterested while playing, and looking lazy on other plays. However this is a very solid pick that adds a needed commodity, young depth on the defensive line. 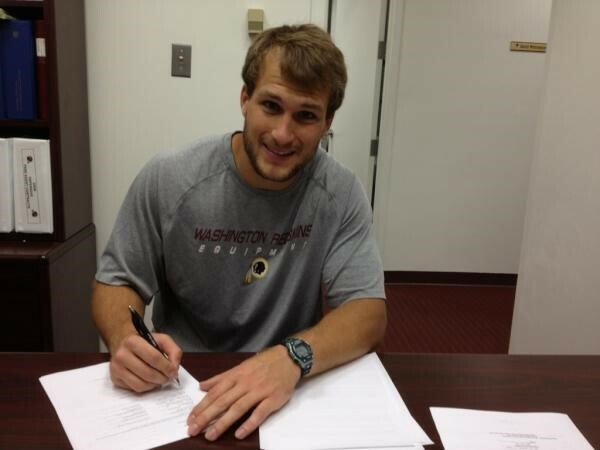 The Redskins made a trade with the San Francisco 49ers. The Redskins traded their second-round pick (44) and fourth-round pick (142) for the 49ers’ second round pick (59) and third-round pick (74). With the second-round pick the Redskins selected running back Derrius Guice of LSU. The running back who was a two-year starter at LSU is an impressive talent. Guice has a mix of speed and power that the Redskins have not had in their backfield since Clinton Portis arrived in town. 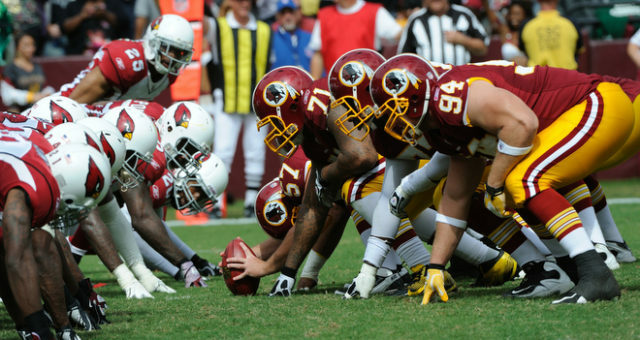 The Redskins rushing offense was abysmal last season ranking 27th in the NFL last season. Gruden has been accused of going away from the running game but with Guice that may give the offense a better balance that Alex Smith will require. Guice ran 1,251 yards and 11 touchdowns last season and for 3,074 yards for his college career. Guice had a surprising drop in the draft amid rumors of bad interviews and and other off the field issues. Guice dropping this late is the second round and the Redskins trading back to add a third round pick plus draft the running back they wanted. With the acquired third-round pick the Redskins selected offensive tackle Geron Christian from Louisville. Weighing in at 6’4″ and 295 pounds, Christian is an athletic lineman. While not as polished as the top offensive lineman prospects in the draft, Christian has great potential based off his athleticism. Originially committing to Miami then changing his commitment to Louisville, Christian was originally a tight end, who switched positions to offensive tackle. This allowed him to be able to keep up with rushers on the outside. However, his technique needs some work. 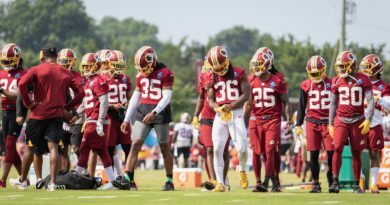 With the tackle positions locked in with Trent Williams and Morgan Moses and swing tackle Ty Nsekhe, Christian has the time to learn from some of the top in the business. There is an outside chance he could be kicked inside to guard but that seems remote. This is a good depth and futures pick. The team added to the defensive back depth in adding Troy Apke. The safety from Penn State in his senior season amassed 54 tackles with three tackles for loss and an interception. Apke impressed at the combine with a blazing 4.34 time in the 40 yard dash. Apke is 6’1″ and 200 pounds and most definitely a free safety. Apke won’t be an immediate starter, however should be a contributor on special teams. The Redskins continued to bolster the defensive line by drafting defensive tackle Tim Settle. The Manassas, Virginia native, measured in at 6’3″ and 329 pounds, the redshirt sophomore was impressive for a good Virginia Tech defense. Last season for the Hokies, Settle amassed 36 tackles including 13.5 tackles for loss as the primary run stopper. Settle could be a nose tackle in the base 3-4 and has enough quickness to play tackle in nickle situations. This gives the defensive lineman coach Jim Tomsula another young talented player to work with. Their definitely will be competition in training camp for the defensive line and much more depth across the board. The second Crimson Tide defensive player selected by the Redskins. The four-year inside linebacker for Alabama, Hamilton played in 33 games totaling 134 tackles, 16.5 tackles for loss, and 4.5 sacks. Hamilton’s last two seasons were cut short by knee injuries, Hamilton has the potential to be a top tackler. Certainly a depth pick Hamilton will be a backup linebacker or could play in a hybrid safety/linebacker role. If Hamilton injuries can stay behind him this could be a steal in the sixth round. The second Hokie and local product selected, cornerback Greg Stroman was selected with the Redskins first of their two seventh round picks. The Bristow, Virginia native, Stroman played cornerback, wide receiver, and returned kicks while in four seasons at Virginia Tech. While not that good against the run, Stroman intercepted four passes in his senior season returning one for a touchdown. Stroman was first team All-ACC as a senior and while a raw cornerback, his immediate impact could be on special teams. The Redskins ended up with Mr. Irrelevant and those choose Trey Quinn a wide receiver from SMU. Quinn is not your typical last pick, as he put up big numbers at SMU. Quinn originally played at LSU playing two seasons before transferring. Quinn in his senior season had 114 receptions for 1236 yards and 13 touchdowns. That is massive production from Quinn, who projects to a slot receiver. While Jamison Crowder is the main slot receiver, Quinn can play there and be used in a variety of ways by Jay Gruden and the offense. Measuring at six feet even and running a 4.55 40 yard dash, Quinn should be a weapon for Alex Smith and the offense.